"Alexander Graham Bell at the opening of the long-distance line from New York to Chicago," 1892. Prints and Photographs Division, Library of Congress. 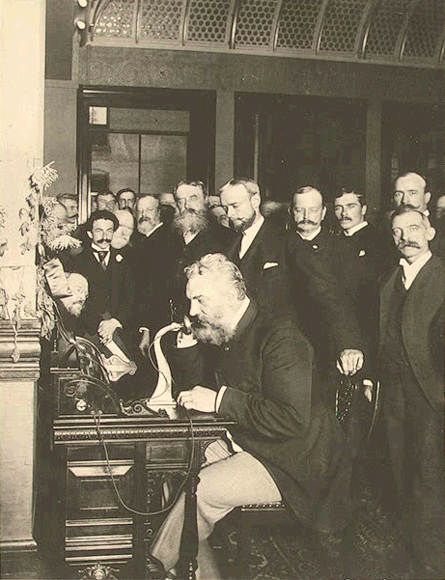 On March 10th, 135 years ago, Mr. Bell placed the first telephone call. He rang his assistant and said: “Mr. Watson—come here—I want to see you.” Not quite “One small step for man one giant leap for mankind,” but completely practical. What would you have said? I wonder what Mr. Bell would think of our iPhones and Blackberries, amazing or complete excess? If I had to list my most favorite inventions, the telephone would definitely be in the top ten. If my thirteen-year-old self was making the list, your genius would be number one. I was a big phone talker as a teen, so much so that my parents gifted me my very own phone line. Phone lines have come a long way Mr. Bell. The line came with a snazzy portable phone (no cord!) with an accompanying answering machine in case I missed an important call. When you’re thirteen, every call is important. But, I had to wait for a phone number to free up. Turns out, when my Mom phoned the folks at AT&T they advised her the only number available was 876-6969. I’m not sure if that number had any significance back in your day, but lets just say my Dad was having none of that. Your fantastic invention has come a long way. I no longer have a ‘land line’ but make all my calls on a mobile phone which fits in my pocket—can you believe it?! It does all sorts of other neat tricks too, like keeps an address book of numbers I can’t seem to remember. And it surfs the internet—but that’s a long story and another letter I’m afraid. Thank you for inventing the telephone. And thanks for your other contributions to the vault. You had quite a lot of interests—you were granted 18 patents in your name alone. And I had no idea you tutored Helen Keller (I think they forgot to mention that in school). Hats off to you good sir! And many thanks! Just saw your write-up on DailyCandy, and I had to check it out. I love what you’re doing, and it inspires me to do more letter writing. Also, the letter to the Starbucks store manager had me in tears. Lovely, lovely. Your blog shows genius! Great idea. I came across your blog on WordPress’ list of fastest growing. Congratulations! Such a fun blog! Your story reminde me of a song I learned in grade school . . .
Well it took Bell to make the telephone ring, and it took Edison to light up the way! It took Robert Fulton in a steamboat to go chug-chug-chugging down the baaaaaay. Howe knew how to make a sewing machine, the Wrghts knew the right way to flyyyyy. So when you’re spelling the word America, don’t forget to dot the “I” for the inventors. Don’t forget to dot the “I”! I always buy stationery yet rarely use it. What a great idea to use a computer to showcase an artifact, like letter writing! Great blog, keeps it interesting. I wish you could send me a letter. Unfortunately, I live in a cave and I don’t get mail. I discovered your blog through Daily Candy as well. I have a paper craft store and featured your blog on our store blog. So inspiring for those of us who still love paper and pen!! !